The community of Whale Cove, or Tikirarjuaq (long point), is nestled within a bay, along the western shore of Hudson Bay. This community was initially settled by three distinct Inuit groups (one inland and two coastal), who came to the area during the settlement development of the 1950s. 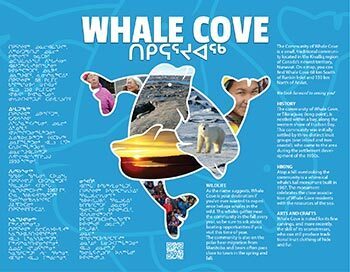 Today, Whale Cove remains a mainly traditional community, with diverging dialects and cultures, originating from both inland and coastal traditions. The abundance of land and marine wildlife has enabled the Inuit of Whale Cove to enjoy a traditional diet and lifestyle. Seal, arctic char and beluga are the mainstay of the traditional diet. Seasonal caribou and polar bear hunting, as well as trout and char fishing, are also regular activities. Take a walk on the beach and pick mussels for a tasty summer or fall treat. To augment the diet of fish and mammals, highly nutritious berries and sea kelp are collected for consumption.